Un Regard Moderne is considered affectionately by many to be the greatest bookstore on earth. 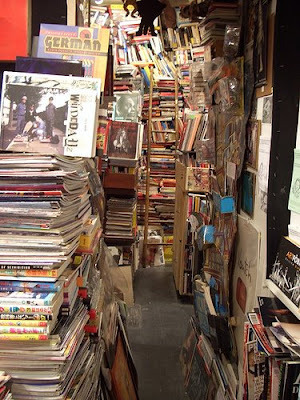 Tucked away on a tiny street in Paris, the space is so crammed with obscure books on art, photography, comics and true crime that only two people can sorta fit in there for browsing. The owner, Jacques Noël, stands quietly on a stack of books in the corner (sometimes only his forehead and a plume of smoke can be seen), graciously willing and able to locate any book from a mind-boggling array of stacks that seem to close in more and more each time I return. I once asked him if he had any books by Polish artist and author Bruno Shulz. He thought a moment and said no, he didn't. But the next time I stopped in several weeks later, without even inquiring, he silently walked over to me and placed two copies in my hands he'd ordered. Ah, Paris! Buenaventura Press has some good photos on Flickr giving you a feel for it.